Get a Grip! With a New Steering Wheel from Buggies Unlimited! After all, it’s your cart. Give it a tough meaner appearance. Make your buddies jealous; make your golf cart stand out! 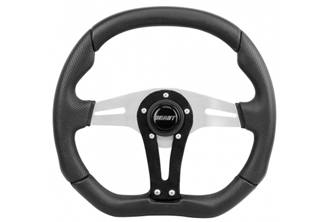 - Nothing will set your cart apart from your friends like a custom steering wheel! - Choose the right adaptor your cart. - We have many styles and colors to choose from. - If you have any questions about what is right for you feel free to contact us at 888-444-9994! We know a cart is more than just a mode of transportation. It’s a lifestyle, a representation of who you are. And that’s why we have an entire section devoted just to those who want to decorate their cart as a means of self-expression. 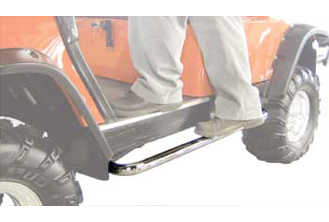 With brush guards, bumpers, hub caps, wheel covers and the best in dash accessories and decals, we’re certain you’ll find the cart enhancement your looking for. After all, it’s your cart. Give it a tough meaner appearance. Make your buddies jealous; make your golf cart stand out.